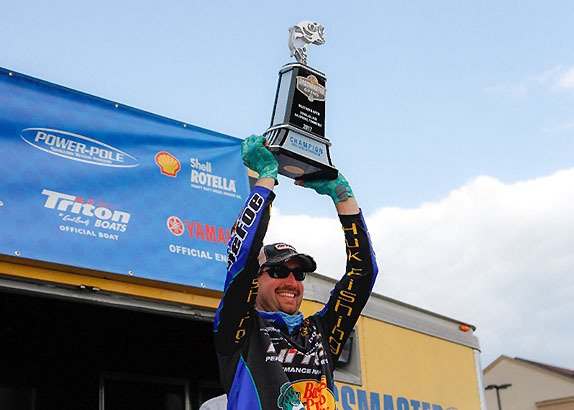 Ott DeFoe was fully committed to fishing a remote stretch of the French Broad River during the Douglas Lake Northern Open. From the moment B.A.S.S. 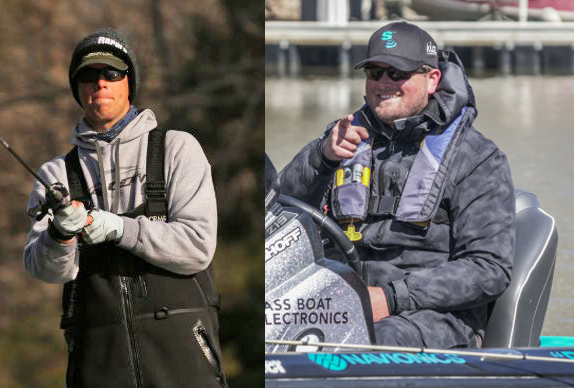 announced the 2017 Bassmaster Open schedule last year, Ott DeFoe knew where and, generally, how he would fish during the Douglas Lake Northern Open. 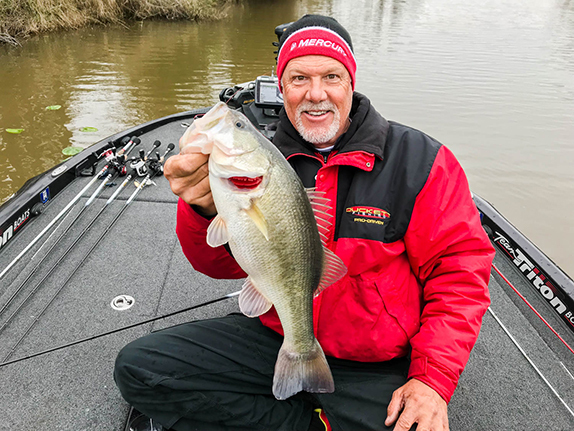 With the tournament set for the second week of September, he knew the lake would already be in its drawdown phase for the fall and winter. He also knew that based on years of experience ��he�s from nearby Knoxville, Tenn. � his best opportunities likely resided in the skinny water of the French Broad River, which feeds Douglas along with the Pigeon and Nolichucky rivers. The only challenge was getting there. The area of the French Broad he targeted and, for that matter, much of the water in the three rivers, is not meant for lumbering, fiberglass bass boats. DeFoe typically has an aluminum boat rigged for local river fishing and this year was no different. It wound up being one of the central factors in his wire-to-wire victory, too. With his fiberglass boat in storage in the Detroit area in advance of this year�s Elite Series Angler of the Year Championship, DeFoe relied on his customized Tracker/Grizzly 1754 SC powered by a 60-horsepower Mercury four-stroke outboard to get the job done at Douglas. He was one of a handful of competitors who opted to compete out of aluminum rigs. He caught 17-05 stringers each of the first two day and closed out his fourth career B.A.S.S. win and second Open triumph at Douglas with a 15-09 bag on Saturday to finish with 50-03. He won by nearly 10 1/2 pounds. No other angler cracked the 40-pound mark. Executing that plan went about as well as he could�ve hoped. 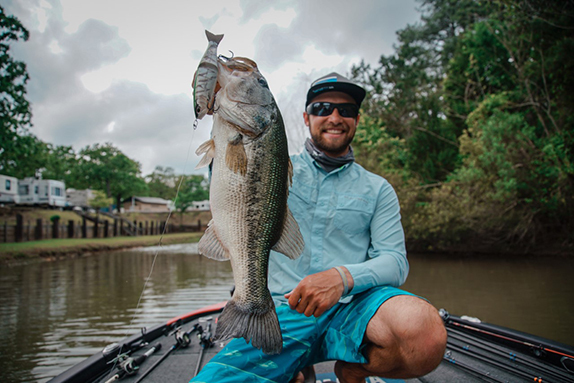 Once he reached his preferred areas, he relied on a jig and flipped at wood targets near the water�s edge before backing off a bit as the water receded on the final day. Here are some more details about DeFoe�s Douglas Lake rout. Douglas has become a regular stop for the Opens in recent years, but DeFoe said he�d never competed there in the fall with the water drawn down. Therefore, he needed a different kind of boat to get where he wanted to go. He had sold his previous aluminum boat back in May. His new one and all the accessories arrived in June. That gave him little time to get the fabrication work done and rig it and test it with the Elite Series season ongoing. �I�d only had the boat at home for a month and of that month, I was only home a couple weeks,� he said. > Custom rod box up front. �I�d rather have that and just throw my tackle in a bag on the floor,� DeFoe said. > Expanded livewell and added T-H Marine switches for livewell pump control. DeFoe�s practice consisted of time spent checking out new water ��some he�d never fished before � and no time spent where he ultimately fished during the competition days. He took the next four days off and when he was back on the water last Wednesday, it was mostly to check the water clarity after the area received a good bit of rain the previous day. He made one cast all day. �Some of it had muddied up and some hadn�t changed,� he added. �The French Broad can be hard when it�s rained. I went up the Nolachuckie, but that place is a boat eater and I didn�t find anything worth going back to. The pre-tournament rain wasn�t what DeFoe wanted to see. He knew he had an advantage in reaching areas of the river others couldn�t in fiberglass boats. Any rise in water levels could negate that edge. �That�s the last thing I wanted to happen because when I�m fun fishing in the fall I like it to be clear and the only way it gets clear is when it gets low,� he said. �When it�s low, half of those other guys are taken out of the equation. On Thursday, DeFoe made the 45-minute (20 to 25 miles) run up the French Broad and came up empty at his first spot. His confidence never wavered, though, even after losing a 3-plus pounder at his second spot. He caught four in quick succession then finished his limit with a 4 1/2-pounder. He expected to get more bites overall than he did and he�s not sure what to attribute that to. Local fishing pressure, possibly. �I do know there was a lot of fishing line in those trees up there,� he noted. His 17-05 stringer gave him a 12-ounce lead over Watson, who hails from Bluff City, Tenn. The jig was a big factor on day 2 as it produced all of his weigh-in fish. He did notice the water starting to fall and clear up. 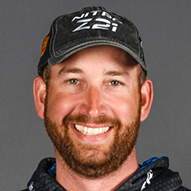 Another 17-05 sent him into the final day with a 3-plus pound lead over fellow Elite Series angler Drew Benton and based on his knowledge of the area, he figured Saturday would be the best fishing day of the tournament. Instead, it had fallen and wound up being just a bad fishing day all around. Even those who stayed on the lake didn�t have good days. There were only two limits caught on day 3 that weighed more than 10 pounds. �I was surprised it wasn�t any better on day 3,� DeFoe said. �I only caught five keepers and lost two. The water got dirtier during the day Thursday and was rising. On Friday, it evened out and cleared a touch. It went from 4 inches of visibility Thursday to maybe 8 inches on Saturday. By then, the fish get accustomed to the water color. It was just a hard day. I think the pressure had gotten to them some. > Jig gear: 7�6� heavy-action Bass Pro Shops Johnny Morris Platinum Signature casting rod, Bass Pro Shops Johnny Morris Platinum Signature casting reel (8.3:1 ratio), 20-pound Bass Pro Shops XPS fluorocarbon line, 1/2-oz. Terminator Pro Series jig (black/blue/chartreuse), Bass Pro Shops Elite Chunk (green-pumpkin blue flake). > He also caught keepers on a vibrating jig, a spinnerbait, a swimbait and flipping a beaver style bait. > DeFoe is well aware his victory has opened the door for another Elite Series angler to qualify for next year�s Bassmaster Classic. He joked about the compensation he hopes to collect this week at the Angler of the Year Championship. �Somebody owes me a steak dinner this week,� he quipped. He�s a lock for the Classic by virtue of his 5th-place standing in points. His goal this week to hold steady and not lose any ground. "It's something I love to do. I'm also a competitive person, and it's great to be able to put the two of them together."